Intended for home use only. Professional / business use will void warranty! Dimensions: Temperature May Reach up to 220 degrees F.
The Gamma Vapor Steam Cleaner is great around the home. This home unit is great for steam mopping hardwood floors, ceramic tile, linoleum, and other hard floor surfaces. It can run up to 60 minutes on a single fill. That means you have time to do the cleaning you want to do. These portable units are perfect for cleaning and disinfecting, wall grout, tile, marble, ceramic, fixtures, bedding, clothes, filters, windows, counter tops, door knobs, toilets, sinks, tubs, cutting boards, cooking surfaces, linoleum, aluminum, stainless steel, acrylic, plastic, base board heater fins, bricks, fireplaces, grease, stains, painted walls, kids toys, baby toys, tools, and so much more. Killing dust mites, germs, viruses, mold and other household contaminates has never been easier. Note: We now carry replacement nylon detail brushes for Gamma 3000 and the Gamma 5000 for only $2 each. Sold in packs of 5. A great value! We have a full range of replacement accessories for Saphire 2, the VC3000 Red, Or any of our commercial units. NOTE: The Gamma 3000 is for home or private use only. Using this steamer in a professional, business or commercial setting will void warranty. We have many commercial use vapor steamers. Click here for a listing. Our professional grade Vapor Steam Cleaners that are great for commercial applications as well as home use. Great for use in the grout cleaning business, restaurants, hospitals, hotels, offices, auto garages, motorcycle shops (great detail tool), jewelers shops, private homes and so much more! 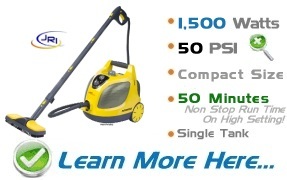 When you want cleaning power you want one of these great professional grade machines! Not only are they powerful and have a million uses they are a pleasure to work with. Clean the safe, chemical free way today! Order now. Super hot steam vapor hardwood floor & tile mopping sanitary & easy! The Gamma 3000 Makes A Great Steam Mop! Steam mopping is the wave of the future. Imagine, no more chemicals or moldy old mops! With a steam mop you ALWAYS clean & disinfect at the same time without the use of chemicals. Every time you mop simply put a new cloth on the steam head and start cleaning. When your done toss it in the laundry. The low profile of the head means you can get into all those hard to reach areas. Steam mopping hardwood and tile floors is just one of hundreds of possible uses for our vapor steam cleaners. Order yours today and enjoy the newest, healthiest, and best way to clean your home naturally! Check out all of our steamers here.